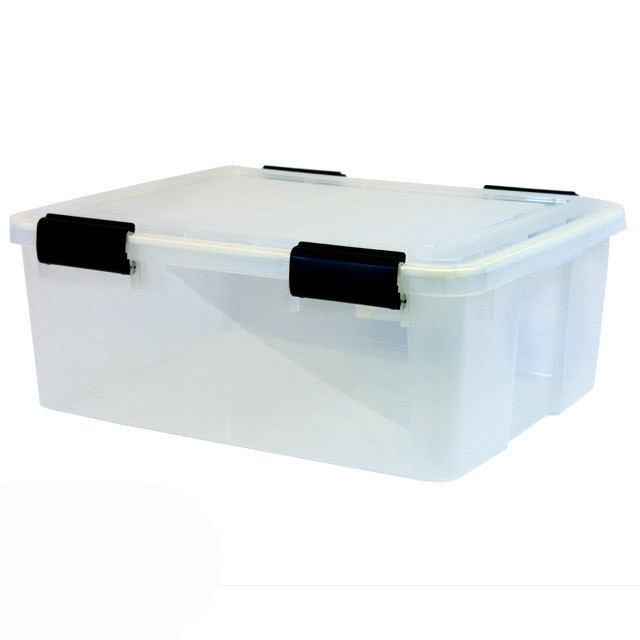 The 30.6 quart Iris airtight plastic container is a water resistant storage box. Made to protect items from water damage and moisture, this airtight storage box has a foam pad in the lid to act as a seal. This box is idea for airtight clothing storage and can also come in handy if you need to keep items dry while camping or boating. From the Iris air tight storage container line (also known as the ultimate clear box series), this watertight storage box is shorter and can easily be slid in areas that might not be tall enough to accommodate a large airtight plastic container. The four black latches work to secure the lid to the airtight storage box. Use this watertight storage box in a damp basement, humid attic, or even the garage and rest assured that your items are protected. Take advantage of bulk pricing with a case pack of these Iris airtight storage containers. Our air-tight containers are made of Archival Grade Polypropylene plastic. They are by nature, Acid Free, Lignin Free, PVC Free and BPA Free. Recycle #5. See also: Plastic Boxes Wholesale and Clothing Storage Boxes.